VigorAP 903 is a high-performance Mesh Wireless solution, designed to expand the wireless coverage, eliminate Wi-Fi dead zones and significantly reduce the cost of network deployments. It can also be used as a traditional access point either managed or stand alone so has the flexibility to be used how you need it. 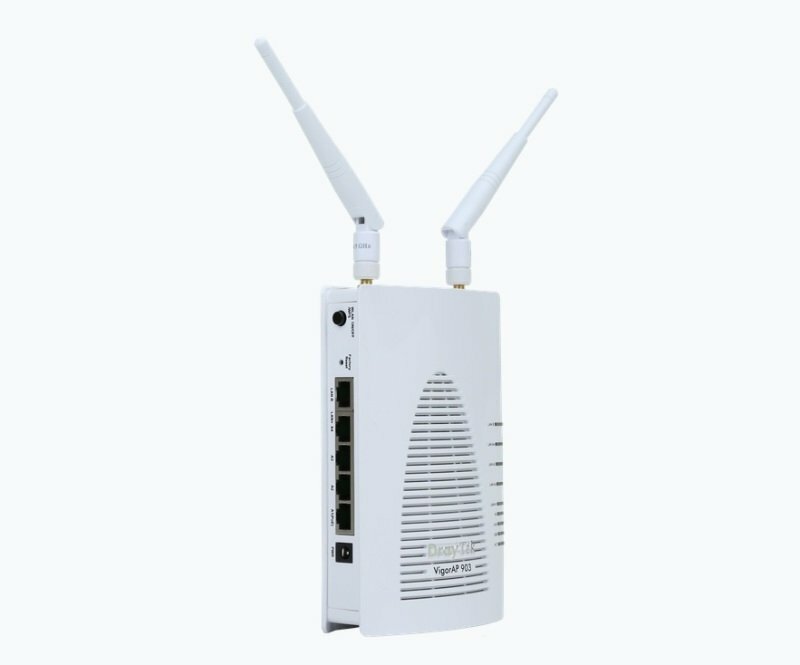 The VigorAP 903 is a dual-band 802.11ac Wave 2 Mesh Wireless solution, designed to eliminate wireless drop outs, stuttering videos, slow download speeds, poor signal and Wi-Fi dead zones. One access point acts as the controller (Mesh root) and in total up to 8 access points create an easy to manage wireless mesh. Extend coverage without running expensive cabling. Mesh Wireless links VigorAP access points across both Wi-Fi and Wired links to cover a large area with a single Wireless network, spanning multiple Wireless Access Points and easily managed from the Mesh Root VigorAP or with the DrayTek Wireless app. The Mesh Root VigorAP links up to your existing Internet router, such as the DrayTek Vigor 2862 and additional VigorAPs join up as Mesh Nodes, which connect wirelessly to the Mesh Root. Your devices see a single Wi-Fi network (SSID) and connect to the nearest VigorAP in the Mesh, instead of a distant Wi-Fi network with low signal. Internet connectivity relays through the Mesh, using the up to 866Mbps 5GHz wireless as the backhaul link, to relay between Mesh Nodes and avoid long waits for downloads. The VigorAP 903 features a new web interface designed for use with tablets, phones and PCs, adapting to suit any device. Dashboard view gives a detailed overview of the VigorAP's status at a glance, see individual connected clients and their traffic usage, ports in use and the utilisation of the VigorAP. The new 'DrayTek Wireless' app assists you with setting up the VigorAP 903 access points and Mesh Wireless network. Once installed on your Smartphone or Tablet, use the Quick Start Wizard to adopt and set up your VigorAP 903 as an Access Point, Range Extender, or a group of VigorAPs in a Mesh Wireless network. Simply scan the access pointâs QR code to detect it, or manually input the VigorAPs default SSID & password, then configure your wireless network with step-by-step guidance. When itâs all set up, view the Mesh Wireless status and connected wireless clients from the app. The DrayTek VigorAP 903 can be managed by the DrayTek vigorACS central management system - a cloud platform which can manage most DrayTek products - routers, wireless access points and Ethernet switches, giving you complete visibility and control of your DrayTek product estate, even without a DrayTek Vigor router on site. The DrayTek VigorACS management system can be used to configure and provision DrayTek VigorAP access points, similarly to performing these actions through the VigorAP's web interface, with a familiar menu layout in the Configuration section of VigorACS. Profiles for groups of access points can be provisioned in VigorACS by selecting a VigorACS network, then accessing Configuration > AP Profile to configure profiles and apply them selectively. DrayTek's VigorACS management monitors the VigorAP 903, with a Dashboard view giving a central overview of the most important information from the VigorAP's current status. The VigorAP 903 can operate in standalone autonomous mode, but can also form part of a centrally managed wireless installation by adding a compatible DrayTek wireless controller such as the Vigor 2862 router. This enables you to centrally control, manage and administer multiple AP devices installed around your building/campus. Management also enables efficient usage of your wireless access point through load-balancing, whereby wireless clients are distributed across several access points to reduce congestion. The DrayTek router operating as the wireless controller can provision DrayTek VigorAP access points using the Central AP Management profiles configured on the router, with an option to Auto Provision - auto configuring newly installed VigorAP access points with the Auto Provisioning profile, upon initial connection to the DrayTek Vigor router's network.